Following Instagram’s lead, its parent company Facebook has now started rolling out the “Your time on Facebook” feature to let users know and manage their time spent scrolling through the feed watching cute cat videos. The social media giant announced this feature to tackle social media addiction or dependency four months ago. It’s now finally here (live on the iPhone XR at the Beebom office) and we decided to take it for a spin to see how well it works, all the features it offers, and whether it’s of any help. 1. 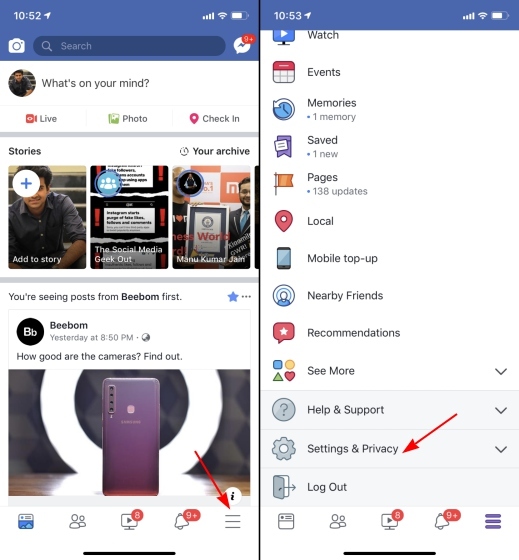 To check out this feature, you simply need to open the Facebook app and tap on the ‘More’ tab and scroll down to the ‘Settings & Privacy’ option. 2. Once you expand the “Settings & Privacy” tab, you can tap the newly added ‘Your time on Facebook’ option to see if you’re addicted to social media. As you can see in the screenshot attached above, Facebook first tells you about the time spent on the platform each day for the last one week. It not only depicts these figures via a graph but also calculates and shows the ‘average time per day’ spent by you on the platform. You can see that my colleague Karthik doesn’t really use Facebook a lot and his average time spent sits at merely three minutes per day, which is fairly good. However, if you’re someone with tall towers and long hours spent on the platform, the collection of tools provided by Facebook can help you curb your addiction. 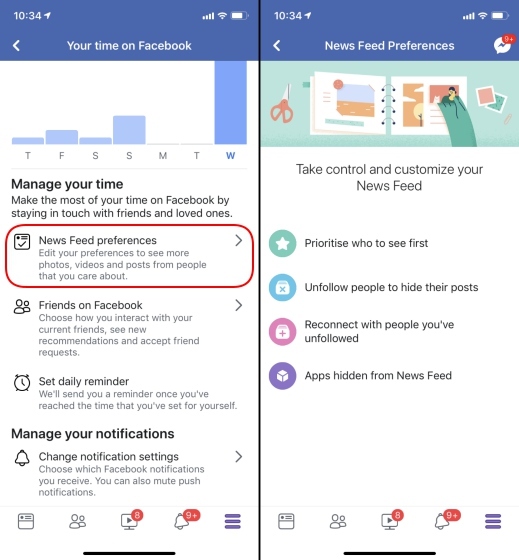 The social media giant has reiterated that its goal is now to help its massive 2.72 billion user base focus on healthy and meaningful conversations, so it provides you the option to adjust your “News Feed preferences” right off the bat. It lets you prioritize users or pages and unfollow others to hide their posts. You can then scroll down and choose to set a reminder for the ‘amount of time’ you want to spend on the platform, which is similar to time limit features being offered by Apple’s Screen Time and Google’s Digital Wellbeing tools. Facebook will send you a notification to alert you when you have reached that time limit, reminding you that it’s time to put the app away. 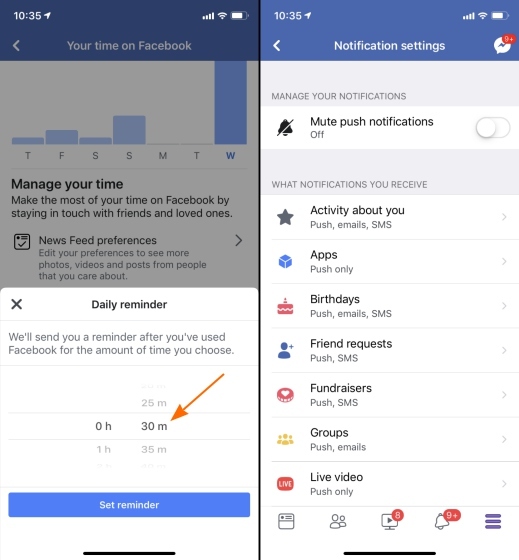 You can also adjust notification settings from within ‘Your Time on Facebook’ to reduce distractions or unwanted messages popping up throughout the day. While all this is good and Facebook is trying to do its part to curb addiction, I have one major concern with the implementation of this feature. 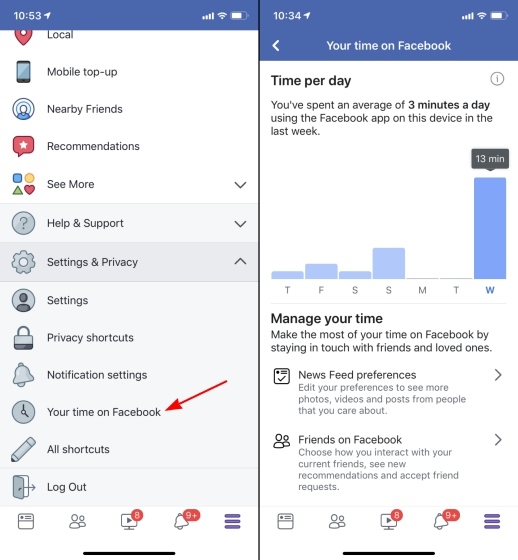 When you open the ‘Your Time on Facebook’ option in the app, you can see at the top that the feature just takes time spent on the device into account. This is, however, not the correct measure as you could still be spending as much time scrolling through posts on other devices. The social media giant needs to give us a fuller picture of our time spent, with per-device stats, which we expect to see in the near future. The feature is currently being rolled out to all Facebook users, so be patient as it should come to your app in the coming days. Have you received it yet? If so, let us know if it’s helping you reduce your usage in the comments below.